I was in Montreal recently and came across this sign while strolling on Avenue Mont-Royal. 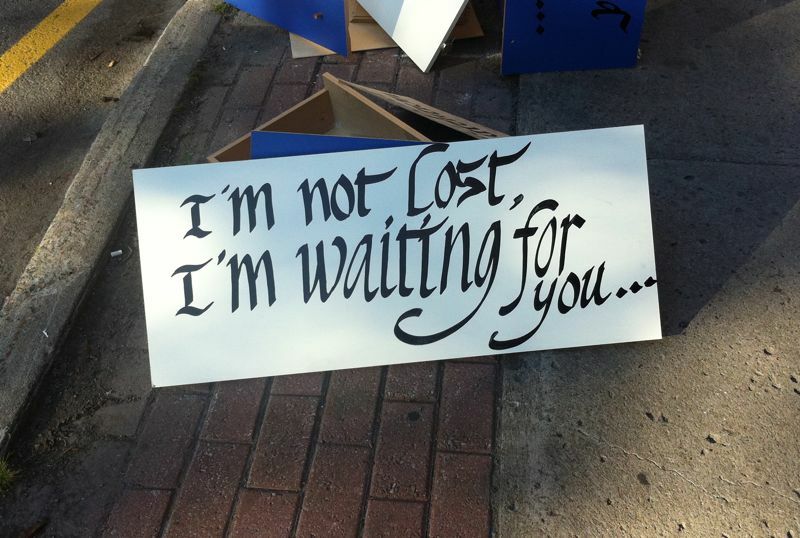 It was part of a whole jumble of signs at the edge of the sidewalk, and of course I had to stop and take pictures. It looked as if an aspiring calligrapher was getting ready to move and was getting rid of his experiments. After a day of exposure to commercial signs and street signs, encountering a sign that’s so personal is a little disarming. Who is the one who’s waiting? Who is “you”? It’s up to us to invent the story. This entry was posted on September 5, 2011 at 10:20 pm and is filed under Script. You can follow any responses to this entry through the RSS 2.0 feed. You can leave a response, or trackback from your own site.